Direct communication between caregivers and relatives replaces unnecessary telephone calls and paperwork. Efficiency gains leave more time for care. Safe exchange in a working environment with a communication platform that was specifically designed for the care market. For better and more efficient workflows. Become a strong employer brand with myo. The advances in digital communication ease recruiting, developing and retaining staff. On top of the App, you have access to the Management Tool. It ensures, that the exchange with relatives lives up to the high quality standards of your home. The Management Tool enables you to view, edit and individually approve messages before they are being sent out. You can also automate the sending of recurring content such as food menus. With help of the Management tool you can centralize all personal data such as contact details of relatives and care givers. You can also assign different responsibilities on company, building or floor level. The Management Tool also compiles all relevant statistics about the usage of the App in one place. 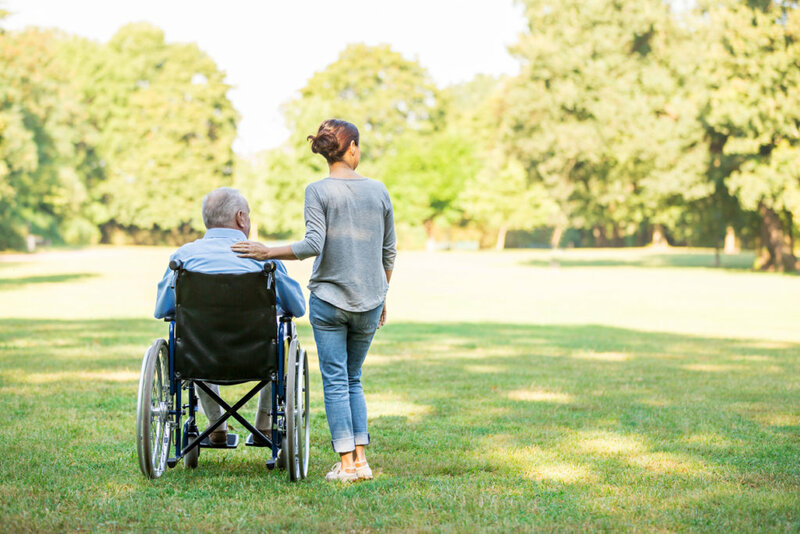 Caregivers want an employer who is up to date, builds trust and protects and defends their interests. 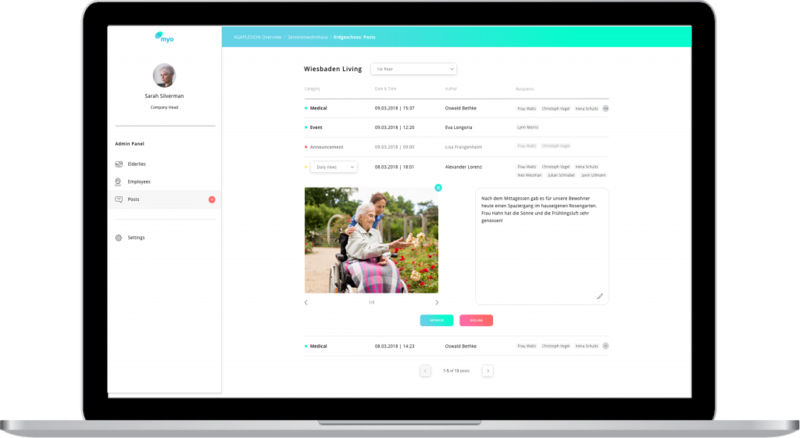 With myo you can show the true side of care: myo makes daily work easier, enhances transparency and fosters a trustworthy company culture. Young (as well as old) caregivers appreciate this friendly, simple and direct exchange. 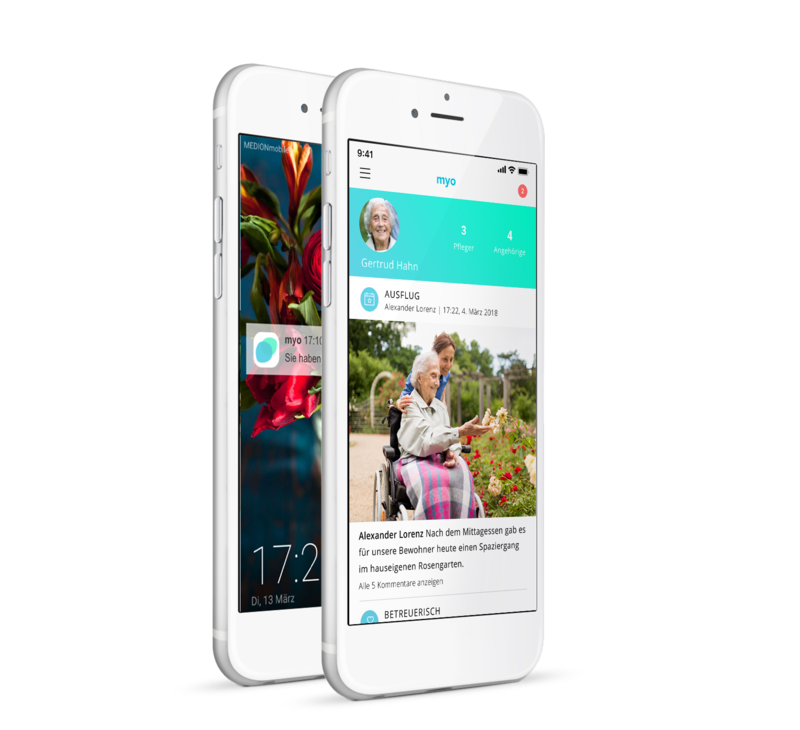 myo is modern care and increases your attractiveness as a care home operator for caregivers, seniors and relatives alike. Especially caregivers perceive myo as something to elevate their profession.